Some dogs are just lucky. 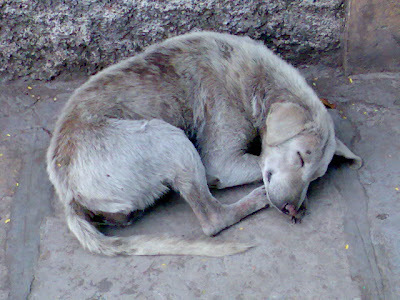 Big, 'cute' and cuddly, this robust mongrel enjoys an afternoon siesta after a large meal, courtesy a colony inhabited by that identifiable human species - the dog lover. There are many who would say that there are hungry children who could be supported instead, but human behavior is beyond our understanding. We do not know why we love and hate things, do we?